Austin Skin Plus | ACNE-FULL TO ACNE-FREE: MY ACNE-SAFE SKINCARE ROUTINE! ACNE-FULL TO ACNE-FREE: MY ACNE-SAFE SKINCARE ROUTINE! I can’t tell you how excited I am to be sharing this blog post. Just a couple years ago, I always dreamed of the day I could write a blog post about “getting rid of acne by some miracle product.” But the problem was, I hadn’t gotten rid of acne! My skin was all over the place and as many methods as I tried, I couldn’t figure out what in the world was causing my acne. Was it hormonal? Was it my diet? Was it my skincare routine? Was it genetic? Like every 13-year-old girl, I started getting acne breakouts more often than I’d ever have imagined. It was embarrassing, and I didn’t have enough makeup in the world to “cover it up”. My mom kept telling me it would pass after my hormones balanced out, but the day never came where my acne finally cleared up. I tried everything from eliminating fried foods, chocolate, coffee, sugar, using ProActive, Neutrogena, a plethora of other shelf brands, visiting dermatologists and being on prescribed meds, trying Korean skincare products, trying the oil cleansing method, and the list goes on and on. For acne sufferers who are reading this, you’re probably laughing with me because, you also, have tried everything to no avail. Finally, at the age of 23, AKA 10 YEARS OF ACNE LATER, I was flat-out tired of it. I had a big-girl job and was willing to invest in other things, such as a vehicle, my health, etc, so I decided it was time to add my SKIN to the list of my investments. While I don’t have ALL THE ANSWERS about acne now, I can gladly report to you that my acne is GONE!!!! I am still human and eat trash foods occasionally or use a bad product on my face that leads to a breakout, but they are few and far between, and I generally know exactly why I’m breaking out when it pops up. In an attempt to begin this skin-investment, I did a yelp search for “Best Facials in Austin” and ended up on the Austin Skin Plus yelp business page, which featured ONLY 5-star reviews from every customer. I wondered if it was too good to be true, but I was ready to “treat myself” to a $150 facial if it meant any relief from my acne. I showed up to my first appointment at Austin Skin Plus expecting a facial and I’d be on my way… I did get a facial, but I also got SO MUCH MORE. Carly, the founder and lead esthetician at Austin Skin Plus, greeted me like we were best friends and then we sat down and had a 20-minute conversation about what acne is, and why acne-prone skin is different than acne on “normal” skin. By the time I was totally and completely overwhelmed with information, Carly led me back to the facial room where I experienced my first-ever-facial. It was semi-painful because there were so many extractions she had to do, but at the same time, it felt so good – It’s like when you have an itch that you have been dying to scratch, and finally someone scratches it. I feel like that sounds disgusting, but that’s the only level of satisfaction I can think to compare it to! After all the extractions were done, she put this lovely serum on my face and showed me all the products she recommended for my skin type. I knew I was about to drop $400 but I was willing to take the plunge after all the 5-star reviews I read. And I’m not rich, by any means, but at the time, I was willing to sacrifice months of coffee and eating out in order to invest in my skin. Carly set me up on a personalized skincare regimen for my skin-type that would change my life (I will share my skincare routine below). She also gave me information sheets with certain foods to avoid, such as dairy (which is SO BAD for acne-prone skin) along with tons of other foods and makeup ingredients that clog pores and cause acne! It meant completely starting over with my makeup and skincare, but I followed Carly’s orders because I was desperate. She not only educated me on the cause of acne, she empowered me to finally do something about it once and for all. So enough about my story, I’m here to share helpful information for other acne sufferers out there. I’m gonna share before & afters of my face, and the products I now use to help keep my skin clear! Here’s a photo of me right now, with no makeup on (and un-fixed hair hehe)! You can probably see some old scarring on my skin from 10 years of suffering from Acne, but as you can see, my skin is pretty much ACNE FREE. Switch to using only acne safe, Non-Comedogenic* products (note: most makeup products that say “Non-Comedogenic” are actually lying – there is no regulation on what is Comedogenic and Non-Comedogenic. I literally have learned to google every single ingredient asking, “is _____ Comedogenic?”. It takes an upfront effort, but once you find some products you love, there’s no going back. 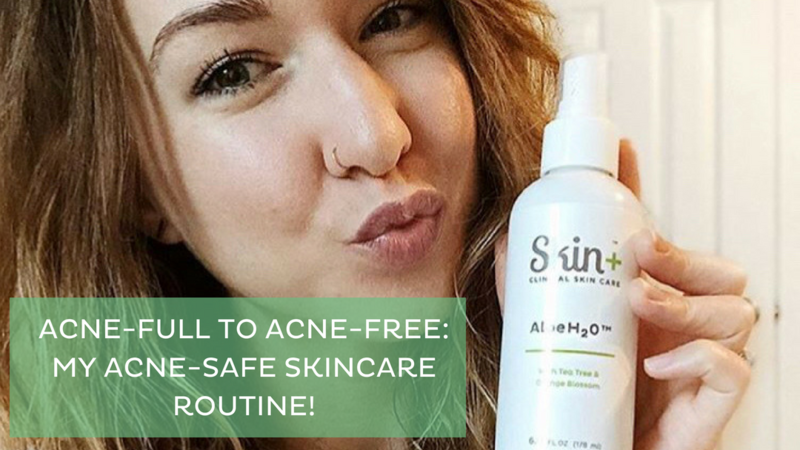 And to make it even easier on you, Carly from Austin Skin Plus just released her new makeup line which is totally ACNE SAFE – so no need to stress about googling ingredients! *Non-Comedogenic means non-pore-clogging. A Comedogenic ingredient is known to clog pores which will eventually lead to an acne flare-up after months of buildup. Often times, it takes about 3-6 months for a comedogenic product to have a visible effect on your skin, so don’t think you’re getting away with using nasty products if you don’t see breakouts right away – the breakout is imminent!! LOL it’s not worth risking it! If you’re ready to invest in your skin, I highly recommend checking out Carly’s products! And if you live in Austin, consider scheduling a facial & consultation at Acne Skin Plus! You will not regret it!